“It’s better to have it and not need it than to not have it and be kicking yourself later.” We start out Cross Camp with learning what to wear. The takeaway message from this section is that having the right clothes to wear and being prepared for the worst conditions is one of the most important aspects of cyclocross that doesn’t have to do with your fitness. With that being the theme, we then get a good look at all the clothing and different scenarios an elite-level pro racer brings to the race. And as I mentioned above, for those just starting out in the sport and for many of us who have to pay for our clothing, Jeremy is giving you the wish list. 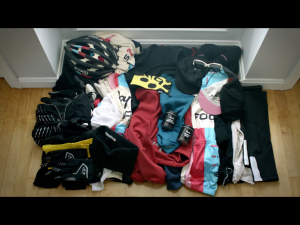 Everything he puts in his bag has a purpose, and having the complete complement of race gear would be great, but this doesn’t mean you have to get it all at once. Buy a couple new pieces every year and before you know it, you’ll be sporting the full wardrobe. Also, make sure you test out your gear in practice and on hard rides. The DVD shows you what works for Jeremy, but what you really want to know is what works for you and in what conditions. This is especially true for base layers and different weight and styles of kit. Although the total amount of gear presented is a lot, it still pays to show up with at least some extra clothing. Having at minimum one extra jersey, bibs and socks is important. If you get wet before your race or have a wardrobe malfunction, having the option to get into dry kit is a huge plus. Being warm and dry before and after races makes the sport a whole lot more fun. As for the video, it’s great to see what Jeremy does as far as dressing for all conditions. Again, you don’t need to own do every combination now, but it’s good to have his best case scenario as a guide. Jeremy next packs his bikes. For 99% of us, this will be useful only a handful of times. If you are like me, you may never fly with your bike. Everywhere I race, I drive to. But if the time comes when I have to fly with a bike, this is a resource I’ll go back to for instruction on properly disassembling and securing a bike for travel. “Bland foods on race day.” What to eat on race day can almost be as confounding as what to wear. Jeremy does a nice job walking you through his routine and detailing what he likes to eat and drink throughout the day. Keep in mind that he races the last race of the day and many of us are racing closer to the morning. If that’s the case for you, the routine is going to vary. As an aside, it will be interesting to see if the answer to my favorite question “what did you have for breakfast” changes after folks watch this video. “Having the course memorized will drastically improve your result.” What do you do when you show up at the venue? When do you arrive? What’s your routine? How many pre-race laps do you ride? What are you doing during those laps? What else do you do to prepare? If you know the answer to all these questions, it’s still worth watching the video. Who knows, maybe you’re not doing everything the best way. And if you are? This could put your mind at ease. Having a routine is key. Jeremy goes through what works for him. It’s a great road map for figuring out your own strategy. “Clinchers aren’t as good as tubulars.” That’s the jumping off point for a tires discussion that covers tire-pressure, tread selection and casing material. Although the focus is on tubulars, and Jeremy gives a good explanation for why they are the preferable choice, it does not mean you can’t race successfully on clinchers. But if you’ve been wondering if you should make the switch, Jeremy makes a great case in favor of a switch to tubulars. 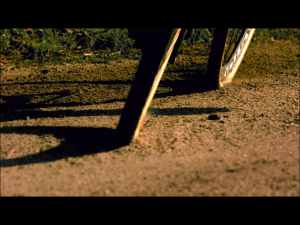 The whole discussion on why tubulars are better is one thing in theory and quite another in moving pictures. This is video, after all, and the section on what correct tire-pressure looks like, is where Cross Camp begins to shine. It is just amazing. Super-slow-motion video of tires hooking up and also collapsing through a turn is worth the price of admission. It’ looks beautiful and really hits home the point. Being able to “see” tire pressure is just cool. “You can’t win a cyclocross race at the start but you can definitely lose a race at the start.” The video includes a detailed walk-through of what to do in the starting grid and how to get off the line fast. The section concentrates on how to prepare yourself for the race and navigate the chaotic start. The standout part of this section is Jeremy narrating what is going through his head as he waits for the gun. “The best part about upping your game in the corners is that it’s the one way that you go faster in a race that doesn’t have anything to do with your power output.” The cornering section is the crown jewel of the video. It is gorgeously shot, super informative, and hits home exactly how superior cornering skills can put you ahead of the competition. If Cross Camp were a VHS tape, mine would be almost worn out through this part. “Start out slow and keep the process long.” It’s the first thing we learn when starting to race cyclocross, dismounts and remounts for the barriers. Jeremy goes step-by-step through how to learn the skill the right way. The camera work here is mapped out nicely with many angles and a lot of good slow motion to complement the instruction. Spoiler alert: There is no mention of the step-through technique in this section. Why? Because Jeremy doesn’t do it. And neither should you. When to push? When to carry? When to shoulder? How do I stop the saddle from hitting me in the back of the head? All good questions. All answered. Jeremy does a nice job discussing the different techniques to shoulder the bike depending on course conditions, terrain and rider size. “Any time you’re bogged down and losing speed it’s best to jump off while continuing to carry your momentum.” Good use of slow motion in this section to emphasize how the body and bike work together to ride through sand. Like the packing section, this is great information that most of us will never use. But it’s fun to daydream about having a dedicated pit crew. And if you are lucky enough to have this type of support, the instruction is great. How to communicate, how to hand off the bike, how the pit bike is prepared, all good points covered in detail. 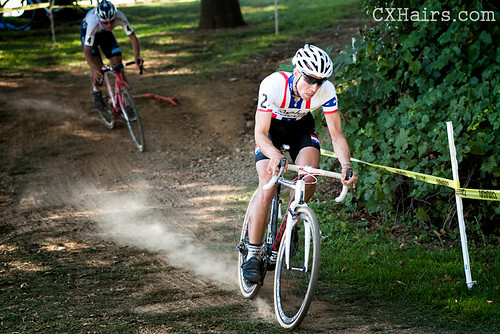 Jeremy Powers’ Cross Camp is a good buy. If you get the $15 download, it’s pretty much a steal. For the beginner and the curious it’s a great introduction to the sport. For the more advanced rider, it’s a nice opportunity to learn something new and also to double-check that your current technique is sound. The video is not a substitute for finding a good cyclocross practice, attending a clinic, or hiring a coach. Instead it is another resource to add to that quiver. And having insights into Jeremy’s way of doing things is invaluable. As Tracy Morgan once said, “If you want to be great you got to study greatness!! Watch the game tape!!! !” This, my friends, is the game tape. I don’t have a scale to rate things on. If I did, this would be 8.5 out of 10 Dufraisses. 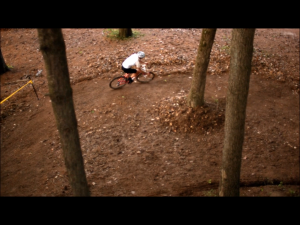 Jeremy Powers Cross Camp Teaser from Behind THE Barriers on Vimeo. i think you’re the first one to review this dvd. i’ve been waiting for some feedback before i pull the trigger for a download. thanks! I wonder if that is dust from dry conditions or smoke from JPow’s power output? I think the video is kind of weak. With the subjects he tackles it should be twice as long. I love Jeremy, but do yourself a favor, don’t pull the trigger.